Theater Arts at Chabot is dedicated to serving theater students, the campus community and the community at large. 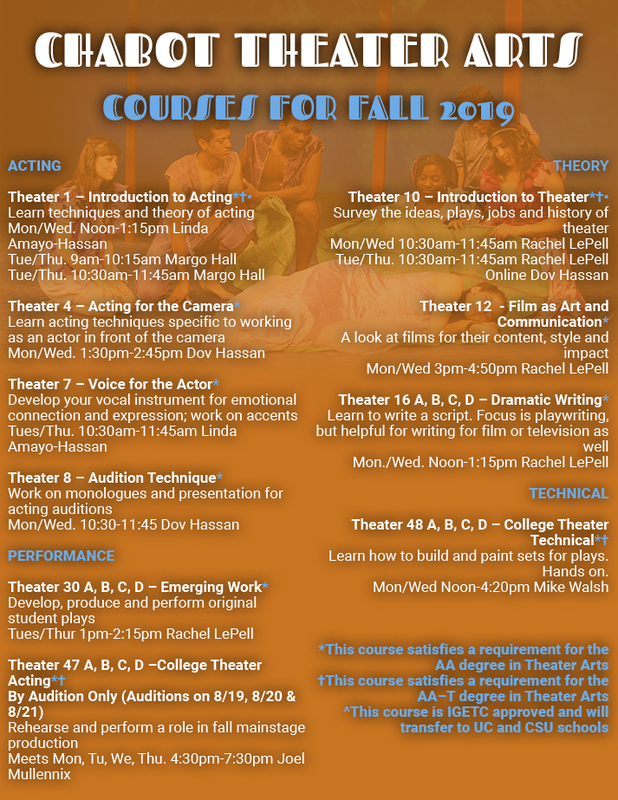 In addition to courses in all the many areas of theater; Acting, Writing, Directing, Technical Theater, Voice, Movement, History and more, we offer a wide range of theater productions. Our mainstage theater productions give students the opportunity to use all the skills they are learning in other courses and apply them under the guidance of a faculty director. While study in Theater Arts at Chabot College advance a student’s abilities as a theater artist, they also contribute to the growth of the whole person. Social consciousness, connection to self, personal responsibility, collaboration, creativity, problem solving under stress, critical thinking, are just of a few of the things participation in theater helps a student develop. Though many of our students go on to further study in theater as well as becoming professionals in the field, all of our students carry the lessons and memories they learned from their theater experiences into whatever they do next. Interested in seeing a performance? Buy tickets to our next show.